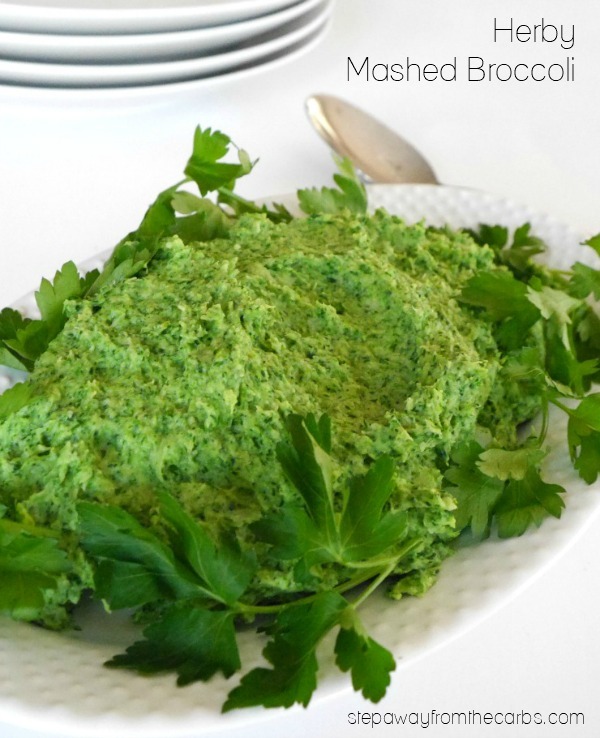 This low carb mashed broccoli side dish is packed full of delicious herbs! We eat a lot of broccoli in our house! I usually steam it or roast it but I thought I would try mashing it. Actually, I put it in the food processor, but you know what I mean! I use the steam-in-the-bag broccoli that you cook in the microwave. It is perfect for this recipe and super easy clean-up. So while that is cooking, cut up some fresh herbs. I grabbed a selection from the garden: garlic chives, thyme and oregano. I think broccoli is pretty versatile when it comes to adding flavors, so just experiment with whatever you’ve got. 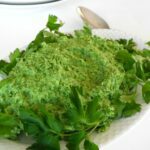 I’ve made it with just a handful of flat leaf parsley before which worked really well! Add the cooked broccoli, the herbs and some cream cheese to a food processor and blend until smooth. Taste and add seasoning as desired. You’ll probably want quite a bit of salt and pepper! Whiz it again and serve.